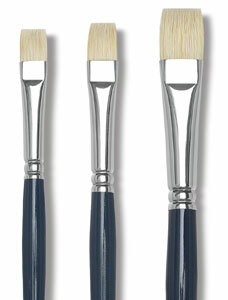 Series 5200 is one of Princeton's best-selling and most affordable brush lines. Strong, sturdy, inexpensive, and made for everyday use, these all-purpose brushes are designed for use with oil and acrylic paint. For students, these are great brushes to start with — but they're also ideal for artists who do a lot of scrubbing and really beat up their brushes! Thick and full-bodied, they hold lots of paint. Princeton's interlocking pure white Chinese hog bristle holds its shape extremely well. Seamless aluminum ferrules are fitted into lacquered dark blue handles.